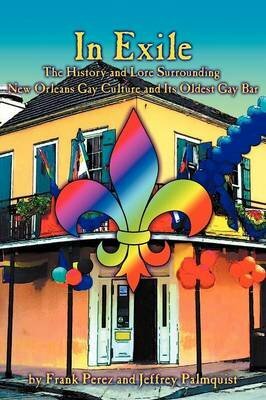 "In Exile: The History and Lore Surrounding New Orleans Gay Culture and Its Oldest Gay Bar" is the first comprehensive treatment of the history of gay New Orleans. Drawn primarily on the recollections of dozens of gay men and women, Frank Perez and Jeffrey Palmquist weave a fascinating narrative of how gay New Orleans evolved throughout the twentieth century. In addition to showing the incredible and previously unrecognized contributions gay people have made to New Orleans culture, In Exile also illuminates the darkness in which ordinary gay people lived secret double-lives for decades and chronicles the social forces which ultimately enabled gay New Orleanians to live openly and honestly. Written with graceful insight and thoughtful perception, In Exile is not only a captivating history book, it is also a beautiful meditation on the intersection of place and identity.